Back to food in Chiang Mai, after a morning spent teaching monks how to cook, err… make sandwiches, I was hungry for some Thai food. The previous day Tawn and I had tried one highly recommended place for khao soi, the northern style curried nodles that are among my favorite foods in the world. 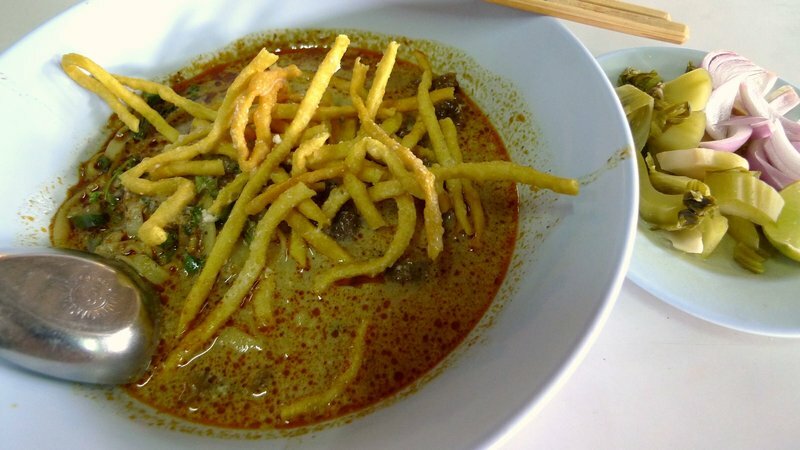 We decided to head over to another well-recommended restaurant, Khao Soi Sameujai Faaham. 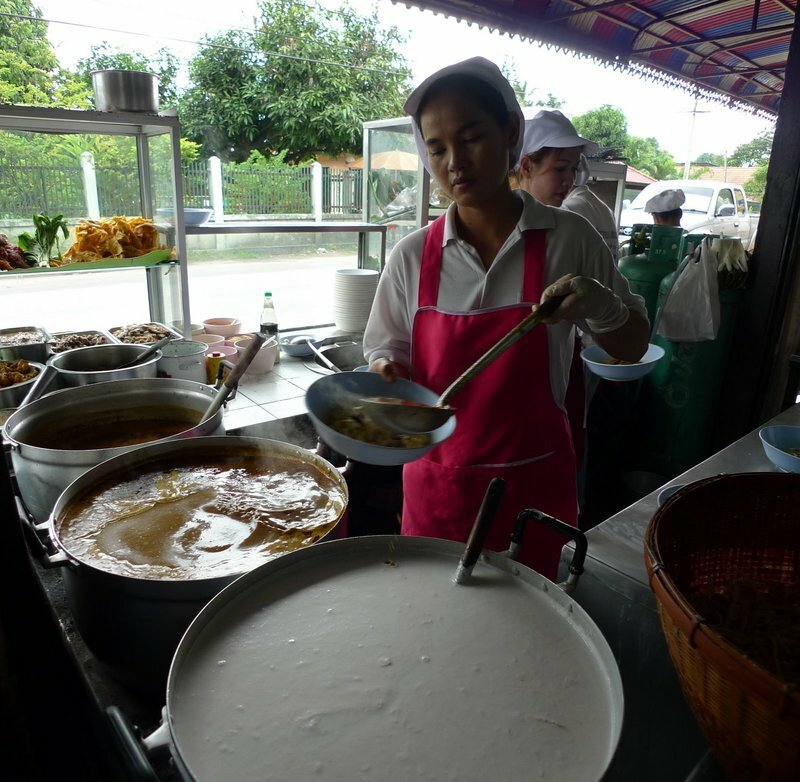 On Faaham Road across the Ping River from the old city, there are two khao soi places just about 100 meters apart. Khao Soi Sameujai Faaham (Thai: เสมอใจฟ้าฮ่าม) is on the west side of the road right next to Wat Faaham. 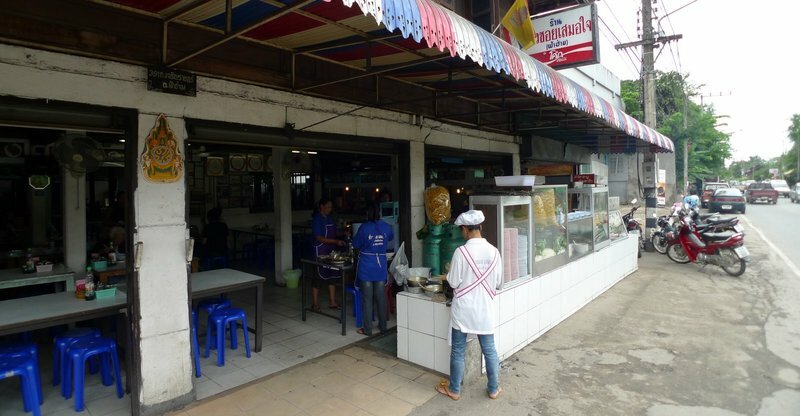 The other restaurant, Khao Soi Lamduon, is on the east side of the road just a bit south of the wat and reportedly serves a spicier version of the dish. Sadly, we did not make it to Khao Soi Lamduon on this trip. 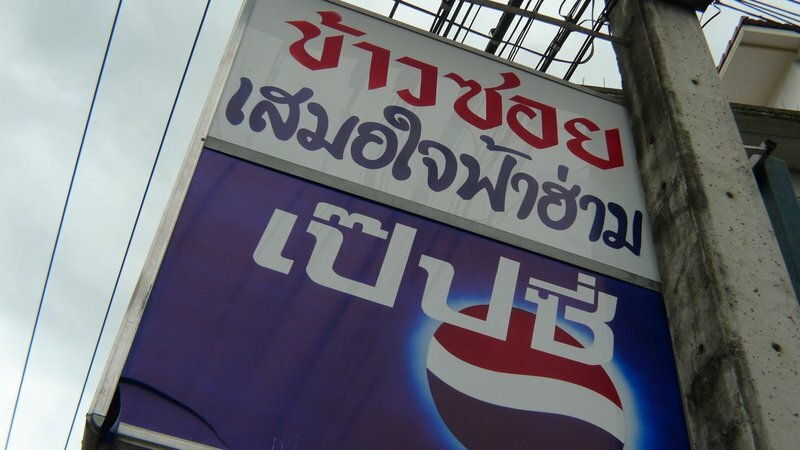 Yet another Northern Thai restaurant sponsored by which cola company? Regretfully, they do not have an English language sign but if you can find the wat (temple), the restaurant is immediately to the right of it. The good news is, their interior signage is very English friendly with photos, names, and descriptions of each dish. The building is more of a food court, if you will, with different vendors offering different dishes, mostly Northern Thai but with some other common dishes (somtam or green papaya salad, with is really Issan or Northeastern Thai, for example) also available. The khao soi vendor is front and center, literally, with huge pots of curried broth and coconut cream simmering away. Our khao soi arrived with the ubiquitous plate of condiments – picked cabbage, a slice of lime, and some shallots (the chilli paste is in a container on the table) – carefully balanced on top of the bowl of noodles and meat. Artful presentation or just efficiency? You decide. Once the condiments were moved out of the way, I got a view of the goldenrod color of the broth. Like always, I tried a slurp of it before adding the condiments, the better to appreciate the unique attributes of this dish. The broth was a little bit sweeter with a slightly more pronounced curry flavor than what we had at Grandmother’s Khao Soi. 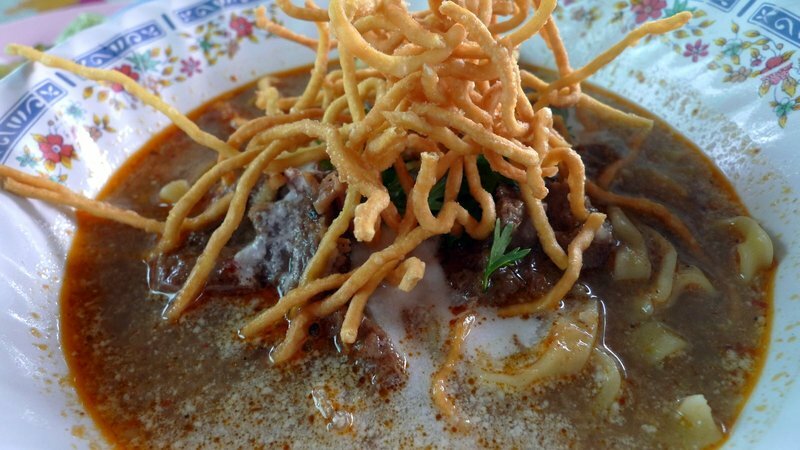 As a point of comparison, here was Grandmother’s Khao Soi. The color correction is accurate: the broth is a little darker and has a slightly meatier flavor than at Khao Soi Sameujai Faaham. Also, despite the big vat of coconut cream bubbling away at Sameujai Faaham, Grandmother’s was a bit more liberal with its application. Which is better? Oh, you aren’t going to lure me into the middle of an impossible dillema! Both versions were very good and both had their own unique qualities. Oh, and I’ll be going back to both on my next visit to Chiang Mai! 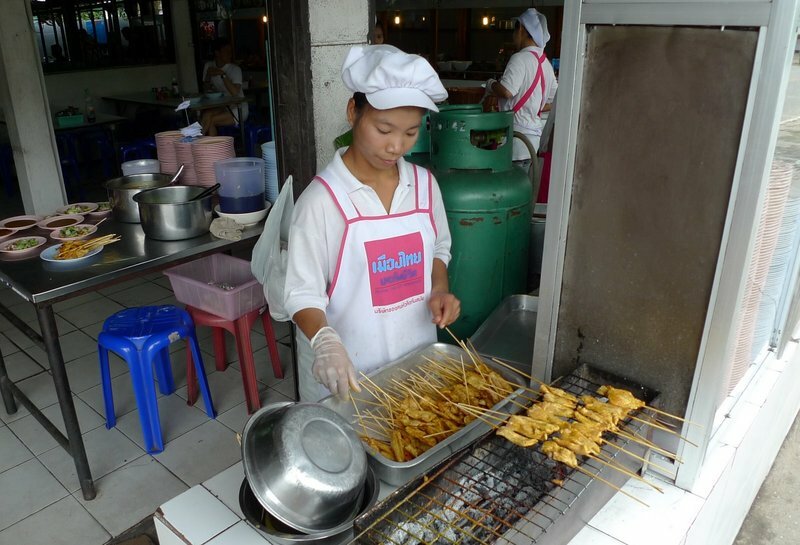 The other vendor located out front is preparing satay gai, or grilled chicken skewers. This treat is definitely an import from the Indonesia/Malaysia corner of the world. It is more than just simply grilled chicken, though. The key to Thai satay is that the meat is marinated in a coconut milk and curry dressing so it takes on a rich flavor and retains its moisture. Typical service for the satay: pickled cucumbers, chillies, and shallots and a dipping sauce made of ground peanuts, red curry paste, coconut milk, and lime juice. I know a lot of recipes tell you to use peanut butter, but trust me, it isn’t the same. Commercial peanut butters have many added ingredients, which change the taste of the sauce. 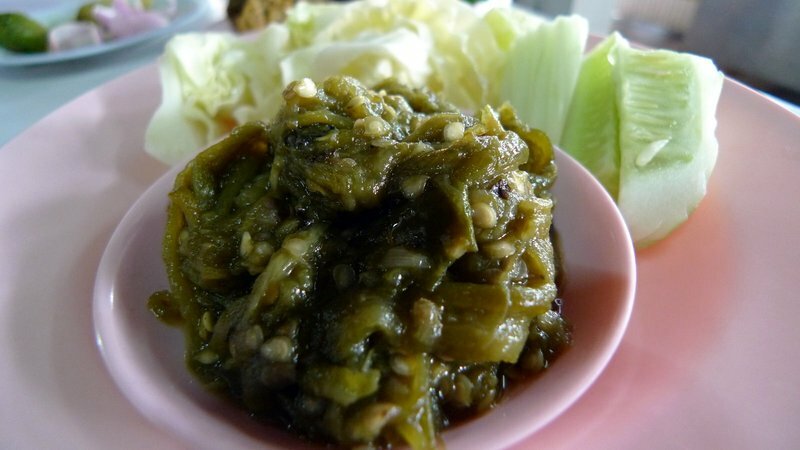 We ordered a dish of naam prik noom, the dip made of roasted green chillies. Compared with the version we ate at Huen Phen restauarnt with its fancy blanched vegetables, this version is quite modest with just some cabbage and cucumbers. This version of the naam prik, though, was spicy! 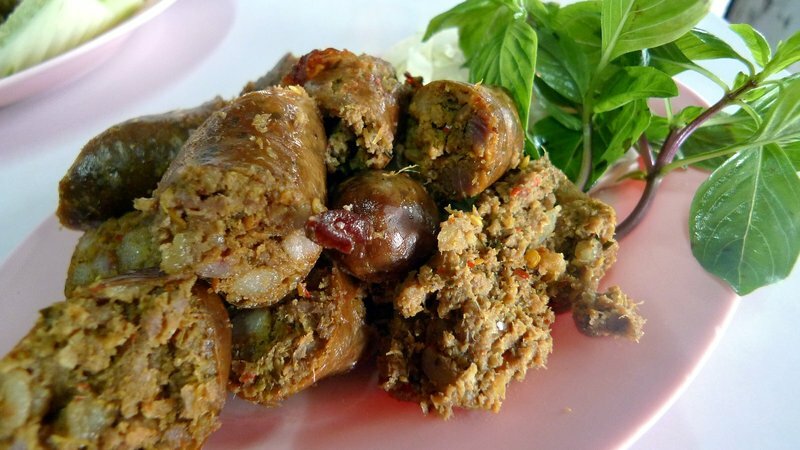 We also ordered sai oua, the herb-filled pork sausage. This is one of those foods that everyone does a little bit differently, so if someone is serving it, you should try just as a point of comparison. We had every intention of saving room so we could stop down the street at Khao Soi Lamduon and split a bowl of khao soi just to try, but we were really full by this point. Alas, yet another reason we must get back to Chiang Mai soon. Walking back to the temple next door where we had parked our car, we spotting this helpful bit of wisdom. Yaa puut nai sing tii mai ruu, leh yaa putt tuk yang tii ruu. “Don’t speak about things which you don’t know, and don’t speak everything that you do know.” Good advice with which to lead your life. In my final entry about Chiang Mai food, we make a special drive out of town to try a Lamphun style restaurant, and I explain a bit about what makes Northern Thai food unique. This entry was posted in Uncategorized and tagged Chiang Mai, cuisine, curry, food, Khao Soi, noodles, northern, Restaurant, Sameujai Faaham, thai, Thailand by christao408. Bookmark the permalink. “Yaa puut nai sing tii mai ruu, leh yaa putt tuk yang tii ruu” is a very wise comment. BTW, great blog you have here. I like a sweeter version of the soup base, maybe because the colour looks more appealing? 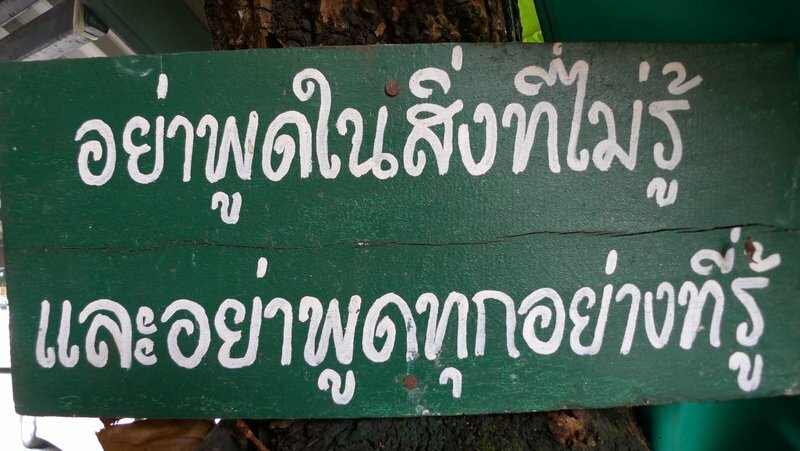 The writing on that sign is meaningful, Thai characters are sure complex looking, hehe. I think I should post the sign at the places I work. The food looks excellent. You find the best places to eat. I find the presentation to be a major part of enjoying the meal and the presentation looks great – in addition to the food itself I am sure! I’ve always wanted to try Thai food. Now you’ve gone and done it. The food looks wonderful. Your photos, as always, are beautiful. I love Thai food and I want some NOW! Unfortunately, I am about to go upstairs to put a Lean Cuisine frozen Spaghetti and Meat Sauce into the microwave. Oh, well. I’m going to get up to Littleton, NH some time soon. There’s a Thai restaurant there. I’m afraid, other than anything made with maple syrup, Vermont is not known for its cuisine. Not likely I could find such variety and complexity in a Thai restaurant over here.I think you have put a trip to Thailand on more than one bucket list. I have never tried to make the chicken satay. I think I will try it now. Thanks for the mini recipe here. Loved the pictures Chris. Thank you. Ohhhh man this is making me hungry! I love Thai satay! Must have been a real treat. Gee thanks a lot, Chris, now I’m developing an appetite for some Thai food RIGHT NOW. I grew up eating pickled cabbage, but it’s interesting how they have a wedge of lime there – was it for the broth or the cabbage? @Victoriawongboy – Thanks, I’m glad you like the blog. Come back and visit! 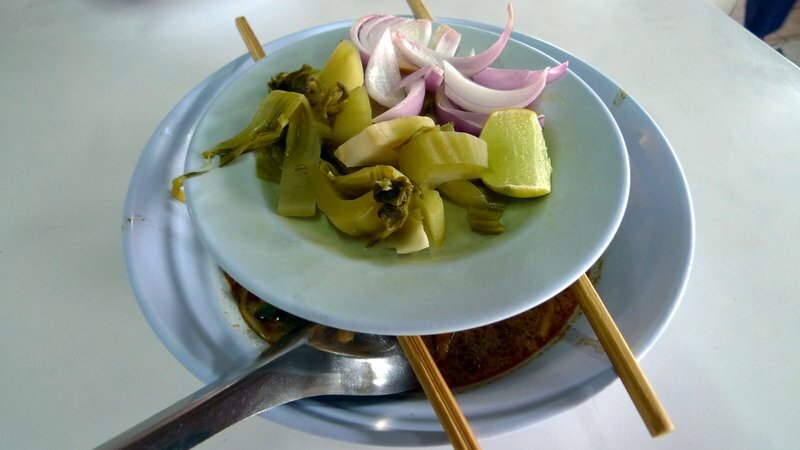 @stepaside_loser – The cabbage, the lime (juice), the shallots, and chilli sauce are all added directly to the khao soi. @konni – Add some nam prik and you’ve got a meal! @NVPhotography – Thanks for the recommendation. Yes, there should be a warning about the food pictures, huh? 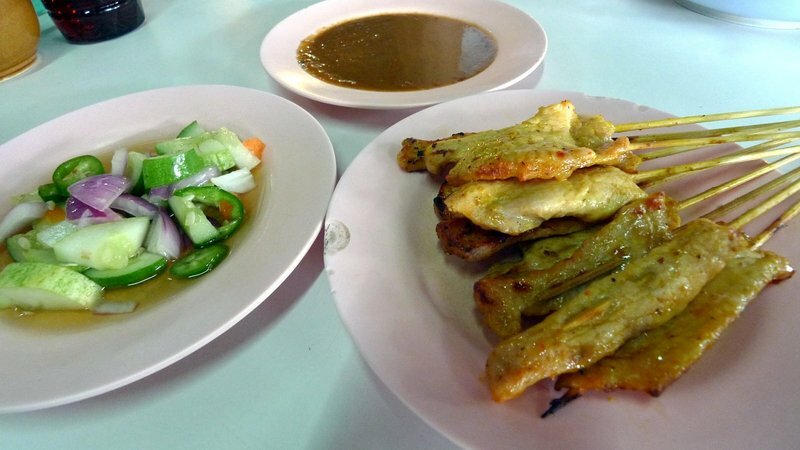 @ZSA_MD – How did your chicken satay turn out? @girlForgetful – Oh, it is always a treat! =D@Inciteful – I have to say, I have never seen curried noodles on a Thai restaurant outside of Thailand. @nurseynursey – So the Lead Cuisine just couldn’t compete with the pics of Thai food, huh? =D@Keeko1 – Have you never tried Thai food?! @yang1815 – @lanney – Yes, the advice really is worth taking to heart. @CurryPuffy – You, a Chinese guy, are saying that Thai characters look complex!? Really!? There’s only 44 consonants and 21 vowels in Thai, compared to some 5,000+ Chinese characters! LOL@Fatcat723 – I think I’m lucky that I know a lot of people who have good taste in food. That helps me find the good places to eat. @christao408 – Haven’t tried that yet. I will do that after Ramadan is over.